This photograph is called ‘Settling Down’ and must be one of the most popular Photographs that I have taken within Richmond Park. 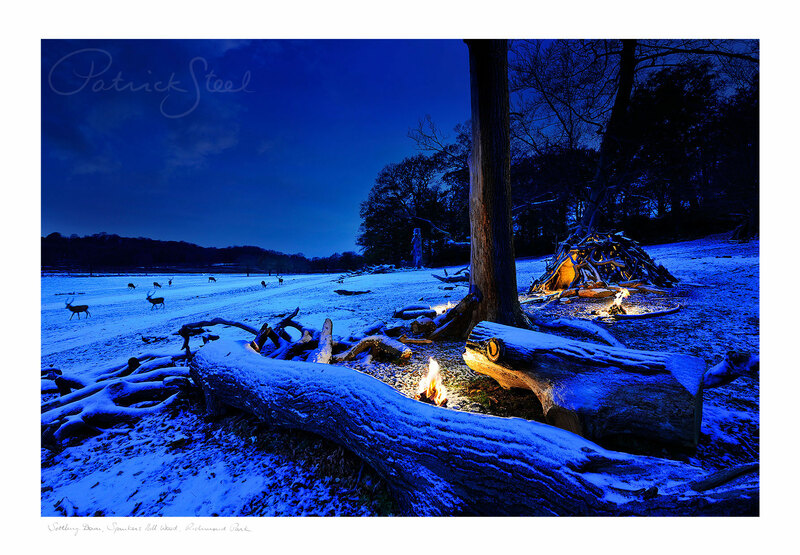 Obviously, I photographed it during the winter and the beautiful blue hue at dusk just sets it off and makes a lovely contrast against the campfire. I couldn’t believe my luck when the stags began to pass by on cue, it was almost as if someone was watching over me and ushering them into position. Interestingly, it was only about four o’clock in the afternoon when I shot this image. People often ask me how did I light up the inside of the tree house? The answer: I placed a flash gun inside the hut, placed a warm lighting filter over it to give the warm glow and triggered it off remotely. I remember being freezing afterwards, covered in snow and wet through, I warmed myself up next to an open fire at the local pub with a smile from ear to ear knowing that I had just captured a beautiful image.